Description: A Boeing Train at College Avenue in Ft. Collins. 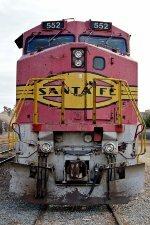 Title: BNSF 552 heads WB. Description: 200mm lens with teleconverter on a digital body effectively 500mm. Description: Westbound Z train rips into the harsh winter sun with BNSF 552, BNSF 8630, & EMD 9007. Photographed at 15:51. Description: Nothing like a pair of Warbonnets, wish i got the leader's number..